I am always looking for new resources, books, videos, materials of all sorts which can help us delve deeper into our lives, and grow and transform. 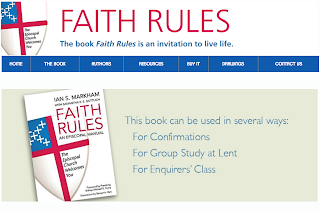 I happened across the "Faith Rules" resources assembled by Ian Markham, the Dean and President of my seminary, the Virginia Theological Seminary. Looks to be some great resources. I recommend them highly! "For those searching for a gentle version of ALPHA, Faith Rules can help. Sam Gottlich and I have created the guidance notes for leaders on the website www.faith-rules.com (under resources). It is great to see the interest the book is generating. When at Trinity Episcopal Church in Wilmington DE, I had some fun reading some of the Rules relating to the Episcopal tribe. Please click here for the downloadable resources"